The Apple Watch may be an all-powerful smartwatch, but sometimes basic features like setting an alarm can become its most useful. Not only does the Apple Watch alarm let you avoid having to get out of bed to snooze your iPhone, but using one also means you don't have to wake up your partner (or pets) unnecessarily. But how do you add or delete an alarm on the Apple Watch, and how do you change it to silent or loud? Below, we'll explain everything you need to know, including how to set timers on your wrist - y'know, for naps. Things may seem simple with Apple Watch alarms, but there are a couple of things you need to know before getting started. Firstly, be aware that anything you set on your phone will also come through on your Apple Watch, though silencing it on one device also silences it on the other. If you want to set independent alarms and keep things just on your Apple Watch, though, that's also an option. To make sure it's silent, you're going to need to make sure your Apple Watch is, well, on silent mode – and vice versa if you want it to sound. We say silent, but of course the Apple Watch alarm will vibrate (give haptic feedback) when set on this mode. In order to turn off the alarm, simply press the side button. And if you feel like snoozing the alarm for nine minutes, just press the Digital Crown. Turn the Digital Crown to your chosen hour, then tap on the minute section and twist again it to set. Tap AM or PM to set when exactly the alarm will sound, then apply to add it to your list of alarms. To turn the alarm off, hit the switch to the right of the time. You can then go back in at a later date and turn the same alarm back on. To remove from the list entirely, select the alarm, scroll down to the delete tab and tap. Since you're likely to be charging your Apple Watch at night, you may not be wearing your Apple Watch to bed and therefore feeling the vibration or hearing the alarm chime as clearly in the morning. Enter, then, the device's Nightstand Mode. 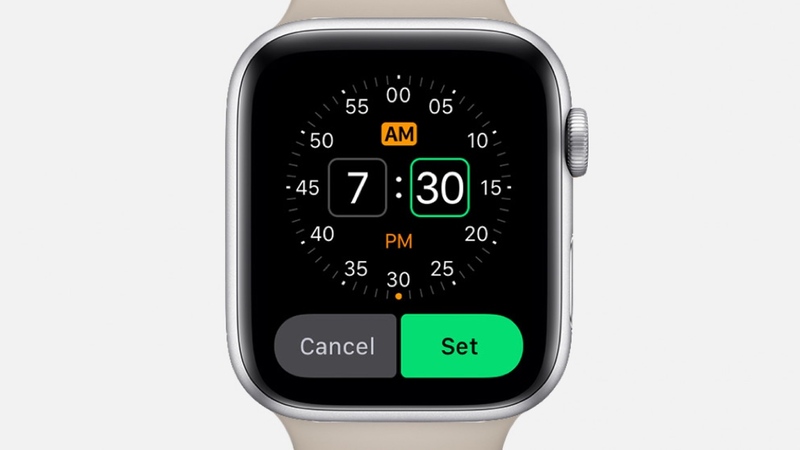 As shown in the image above, this is when your Apple Watch displays the date and time, the charge percentage and also an icon indicating any potential alarm you have set. All you need to do to turn Nightstand Mode on is to head to the Settings app, tap through to General and then hit Nightstand Mode on. From then, you'll be able to see the Nightstand screen by tapping the screen or touching the Digital Crown or side button when the device is on its side and charging. Open the Timers app on the Apple Watch. Tap on either minutes or hours, then use the Digital Crown to tweak the timer. While it's running, you can also Pause or Cancel the timer. When the timer ends, you'll get an alert on your wrist, at which point you can tap dismiss to help it disappear.